Premiere beach house rentals on the beach in Lincoln City (central Oregon coast). Ideal for family reunions as well as conferences. Ask for our free VHS or DVD tour. Member Lincoln City Chamber of Commerce. 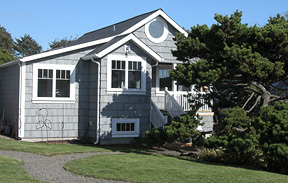 WATAVUE Historic Beach House and Guest Cottage and WECOMA Creekside are located on Wecoma Beach, at the north end of Lincoln City, just a ½ mile from Chinook Winds Casino. These historic homes and spacious grounds are ideal for family reunions; they're also business equipped for conferences and retreats. Gourmet kitchens & outdoor grilling, beautifully appointed, loaded with games, close to galleries, shopping, casual and fine restaurants, golfing, fishing, and much more. 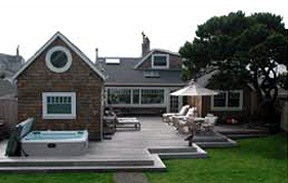 Click on the respective links to explore their potential for your get away on the central Oregon coast.